According to reports, there have been a few details ironed out for the coming seasons in Formula 1. The first to be decided, after a meeting to vote, is that the controversial HALO system will be delayed until 2018 at which time the FIA is set to explore the feasibility of the device further. Another decision was discussed in the matter of starting races behind the safety car which has happened twice this year with the most recent occasion at the British Grand Prix and many fans felt deprived of what may have been an interesting standing start. The concept here would be to run behind the safety car to establish a reasonable starting condition and then stage the cars for a standing start. The FIA’s Charlie Whiting is said to be holding a conference to explain the proposals on Friday. A couple of other changes were made as well – it was apparently agreed that there’d be no more policing of track limits (I bet that’ll be reversed the instant there’s a public backlash). Regarding the safety car starts, the change does nothing to stop the annoying spectacle of the SC trundling around until the racing line’s ready for inters or slicks. All it will ensure is a chaotic and dangerous standing start on cold tyres & brakes when the SC finally leaves the track, followed by an equally chaotic dive into the pits. My question for the HALO is the ability to extricate the driver in a rollover. Earlier this year in the Guitierrez/Alonso crash, had the car been on fire could Alonso have been able to get out of the car that quickly with the HALO device in place? If a car rolls over is the HALO going to stay in place or break off, possibly injuring the driver? Too many questions. Fernando Alonso in Australia. He had no wheels on the inner (left) side by the time the car stopped. Fortunately it was an accident where the relevant protection (circuit boundary walls) was more than up to the job requested of it. Actually, if you look closely at the pictures, all four wheels are still attached (hanging on by the kevlar wheel tethers that run through the wishbones). The left rear tyre came off the rim, but other than that they’re all there. Btw, that was one mighty crash – I was really glad (and a little bit surprised, even) to see him walk away from that one. Well, I suppose it could be worse: It could be NASCAR (no rain tires). I chuckle when NASCAR announcers say “The greatest drivers in the world are gathered here today for…”. Until they run in the rain that’s one of the largest lies ever told. And the sad thing is that years ago they had successful testing of rain tires but never used them in competition. Apparently four hours of commentators trying desperately to find ANYTHING to make interesting television is perfectly fine. I’ll never get it. At least the FIA is willing to try new things and then quickly get rid of them when they don’t work. Charlie Whiting was much clearer – Halo will be introduced in 2018. Giving them chance to test it but it will be implemented. I just read the FIA (?) are going to explore “active” cockpit protection… no doubt teams will explore using it as a movable aerodynamic device… encountering imagined flying objects at the end of every straight. Apparently, another item that has been changed is that in qualifying, whenever a double waved flag situation occurs, the session will be red flagged. 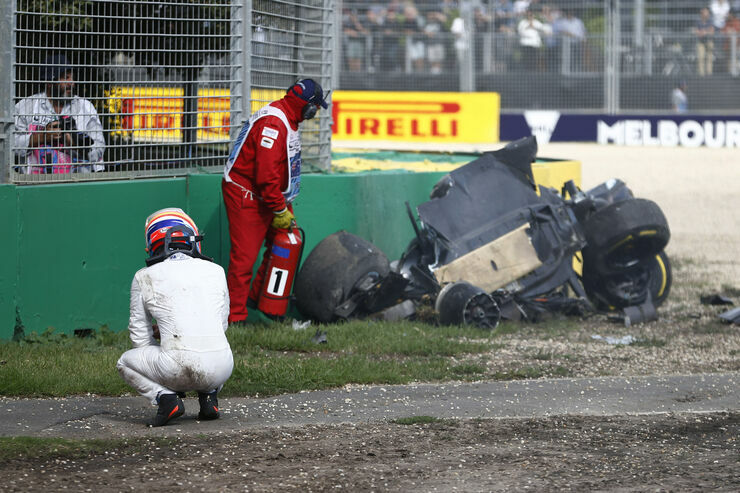 Charlie Whiting said this will “remove any discussion about whether a driver slowed down”.